With the exception of The Eight Doctor (in terms of televised episodes, which are the ones I go by), The Ninth Doctor has the shortest tenure of any Doctor on Doctor Who. Allow me to state how I got to this conclusion. If you go by number of stories, The Ninth Doctor has a total of ten. The Sixth Doctor has a total of eleven stories IF you (like me) count The Trial of A Time Lord as four separate stories (The Mysterious Planet, Mindwarp, Terror of the Vervoid, and The Ultimate Foe). IF you count The Trial of a Time Lord as ONE story, then you bring the Sixth's count to eight. 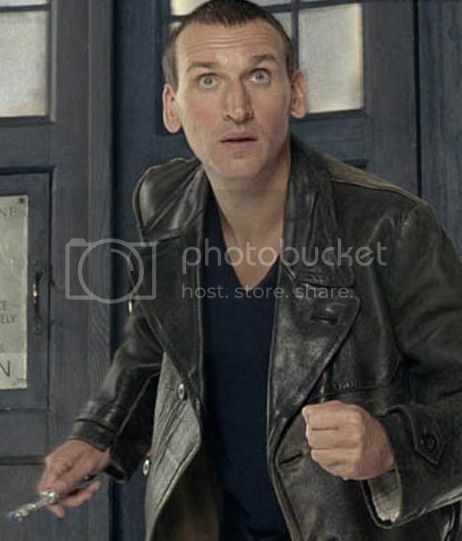 HOWEVER, if you go by number of episodes the Ninth Doctor has a total of thirteen (thanks to three two-episode stories). Even by that standard, the Sixth Doctor still beats him because The Trial of a Time Lord has fourteen episodes ALONE (and that's if you count Trial of A Time Lord as ONE story. If you went by the FOUR story cataloging...) Tricky thing this accounting business. Now that we have come to a parting of the ways with our friend from the North, it's time to pause and look over his tenure. On the whole, I think Eccleston was 'fantastic' as the Doctor. He could be funny, he could be deadly serious, he could be difficult, he even, at least once, could show genuine fear. There were a variety of reasons why Eccleston decided to leave, and I wonder if Bad Wolf Part 2 would have been different if he did not have to regenerate. Eccleston is in retrospect, the moodiest, dare I say, the angriest of Doctors, and it's not without blame: he saw all Gallifrey destroyed (something I have always felt was a mistake from the get-go). Still, given he was there for just one season, I think he will rank on the higher end of the Doctor scale (even though I think all the Doctors have been good). Now, it's on to our selections for the Best of Doctor Who: Series/Season One (Revived Edition). Tough call since all were wonderful, but as I look at things, I give the edge to Wanamaker only because unlike the others, she had to use only her voice to create her character. The fact that she could only be heard and still create a magnificent character (a bitchy trampoline, if memory serves correct), only adds to the strength of her performance. Now, is it fair to put a Companion here while not in the female category? Well, I think it's because Captain Jack, as beloved as he is in certain circles (though not in this one), I felt worked best as just a guest star on The Empty Child Parts 1 & 2. Note how he was redundant in Boom Town to where we almost forgot he was there. He was the requisite action hero in Bad Wolf Parts 1 & 2, and would it have killed Davies to have left him for dead? I understand writers have an affinity for their characters, but for some reason Steven Moffat has done his best to build up the characters he's created (Captain Jack Sparrow...I mean, Harkness, and later on DOCTOR River Song) to being these Doctor Who Icons without whom the show simply could not go on. In both their cases, I've never been particularly overwhelmed with either Harkness or Song (however, I digress...Spoilers, Sweetie). This is why I consider him a Guest Star (although I begrudgingly have to recognize he IS a Companion). However, I can't get into the Captain Jack mythos both Doctor Who and Torchwood build up. As for why Dingwall over Callow (a close vote)? Well, I think Dingwall brought a great tenderness and tragedy to Pete, someone we end up liking but know must die. Though both Callow and Dingwall were beautiful performances, I was more moved by the latter emotionally. There's something sleazy in how Van Statten disposes of everyone, and worse, how he even does what was once inconceivable: make us feel sympathy for a Dalek. If only that Dalek hadn't yearned for the 'human touch', if you will, we might have had another winner altogether. Again, another curiosity: a Companion as a villain? Well, first, he had no problem leaving Rose behind in Dalek, and then his greed for knowledge (which would grant him wealth and power in his own time) caused so many problems for everyone on Satellite Five. In so many ways, Adam Mitchell was a major problem, so he is in a strong sense, a villain. I had to think between three emotional moments in Doctor Who: Season/Series One, and it's so interesting that for a science-fiction show, we have many tender moments. This moment, when Rose gets to say goodbye to the father she's never known (at least until now), knowing that her face will be the last thing Pete will see, is extremely heartbreaking. With all the power of time travel, Rose still cannot alter the future to where she and her father will be together. They had this brief moment, and if one extends things, all children eventually have to let their parents go. It was a beautiful moment. A good Doctor Who frightening moment should make you curl up in your sofa, wondering what will happen next, fearing for your heroes. The cliffhanger in The Empty Child Part 1 did exactly that. When Lynda gets killed off, it is an especially effective moment of terror, made especially more so due to the silence (not to be confused with The Silence, another Moffat-ramming-pseudo-icons-down-our-throats business). I think, however, having all these people, particular the titular child him, menacing an action hero (Captain Jack), the intellectual hero (The Doctor), and our fighting beauty (Rose Tyler), with seemingly no way out, made that moment far more frightening. The cold of the Editor's room, the chaos of the floor the TARDIS landed in, all contributed to making The Long Game a set that could not benefit from being a period piece (which both The Unquiet Dead and The Empty Child Parts 1 & 2 were). Instead, we had to imagine a place that could exist, and one that was both familiar and alien. Here, there can be no contest. As much as I like the 80s (though my memories of them are vague), it is almost for certain that period pieces win out, and from the shrouds of the undead to Rose's gowns and Dickens' frocks, The Unquiet Dead gains an edge. I can't help that Ahearne earned three nominations: he is the director of three of the best Doctor Who: Season/Series One stories. When considering directing, it isn't just the story, but the performances. All the performances in Father's Day, from Camille Couduri's Jackie Tyler and Shaun Dingwall's Pete Tyler right on down to Billie Piper and Christopher Eccleston, were all so beautiful: going from comedy to tragedy so effortlessly. It takes a great deal of talent and ability to introduce a historic figure without making it a gimmick. Gatiss' screenplay for The Unquiet Dead kept a balance between being a fright-fest and being a great man, a true genius, contemplating his past. I could talk about either The Doctor or Charles Dickens, and maybe I am talking about both. Here, Dickens is an integral part, and the clever moments ("What the Shakespeare?") mixed in with the fantastical (the specters haunting Dickens' reading), and even the sad moments (Gwyneth's end) made The Unquiet Dead a brilliant story. It was really a matter of going over which earned a Perfect Ten. Only two stories did. One blew me away, one moved me almost to tears. So close, so close. However, after some thought, I still can't help being impressed by The Unquiet Dead's wit mixed with sadness. I had narrowed down to two, and both involve Russell T Davies. First, for an openly gay man like Davies allowing one of his characters to use the word 'gay' as a slur is to my mind simply inexcusable and highly distasteful. However, at least a defense can be made that this would be true to the character: Rose is a working-class girl with no great education, so one could argue she doesn't see it as offensive. What I DON'T like, and have never liked, is to have the person's political views enter into the show so nakedly. When trying to inject politics into science-fiction, it should be subtle and clever (District 9, the original The Day the Earth Stood Still). Davies doesn't have that subtlety: Aliens of London Parts 1 & 2 were nothing but his thinly-veiled hatred for George W. Bush and Tony Blair involving us in the Iraq Intervention. Even that I could overlook, but having the Doctor take a direct position (the joys of perpetual Labour governments providing womb to tomb services) is something I don't understand, believe, or accept. Beyond useless, The Mighty...has the silliest name of any monster, and he has such a long name just to show off how long his name can be. One can't take such a monster seriously, and frankly, since he doesn't look like he is the brains behind this operation, I can't believe the menace is real. Yes, in the long term, The Mighty...was just a front for another villain, but then it makes me think The Long Game really just wasted my time. The unfortunate thing about having only ten stories to deal with is that if you nominate five for your best, by default the remaining five will be the lumped with the worst. Granted, I wasn't a fan of any of these, but out of all our nominees The Long Game is the most inconsequential. Minus the fact that it got rid of one our worst Companions (though that is for another time), The Long Game had points of logic that werent' answered (how does Suki go from dim girl to super-rebel at a turn of a dime?) and a monster who was neither terrifying or interesting. Now, eventually, once the goal of seeing every Doctor Who story made is complete, we will be in a better position to judge where the Ninth Doctor stories fit into the Great Ranking. I'm still debating whether to have a separate Ranking for the Revived Series. Certainly there are great things in Eccleston's tenure, and some things I didn't care for. Well, there it is for now. We close out our Christopher Eccleston aka The Ninth Doctor Retrospective. We now move on to the Tenth Doctor, David Tennant, knowing that some of his stories will be brilliant, some I have no desire to revisit, and some that are a complete mystery.